Handicap shower stalls are necessary for those confined to a wheelchair and those with limited mobility. They bring peace of mind to the disabled person and their family. Handicap shower stalls are necessary for those confined to a wheelchair and those with limited mobility. 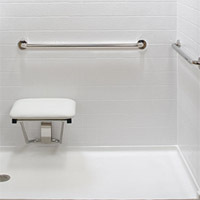 Handicap shower stalls bring peace of mind to the disabled person and their family, and make it easy for the caregiver to assist in getting their patients into the shower. While a shower seems like a simple thing to the able-bodied, to the disabled, a shower is out of reach without the special accessibility of a handicap shower stall. Depending upon your needs, handicap shower stalls can be fitted with different options to make bathing accessible again. Different options include shower ramps for wheelchairs and commodes; shower grab bars, wide seating areas and adjustable height shower heads. Most handicap shower stalls are also constructed with fiberglass, which makes for easy cleaning. There are no tiles to come loose or pose a risk to safety. Many handicap stalls also include a safety feature that prevents the water from getting too hot. This scald protection is essential for those with limited mobility. Any or all of these options can be added to the handicap shower stall of your choice. When deciding on bath shower stalls, make sure to measure the installation area. 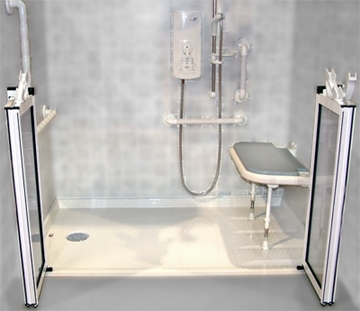 Most are easily installed if they are prefabricated shower stalls but may require professional help if you opt for more add-ons such as a double door enclosure that allows wheelchair accessibility and guards against water splashes. Square shower stalls tend to have dimensions of 36 inches by 36 inches while rectangular ones can measure 70 inches by 38 inches. Handicap shower stalls can vary in price depending upon the features required, but the price remains cheap and reasonable at $1500 to $3000. While there are some insurance companies who may cover part of this expense, you should check with your insurance provider before making any decisions. If insurance coverage is not available and the cost is out of reach, try looking for grants from local, state or federal government agencies or non-profit organizations. Shower stalls for the handicap comes attached with shower accessories like brushed stainless steel grab bars and preinstalled holes for installation of handicap shower heads. Shower stalls are built with a slip resistant floor. Location of drains can be purchased for the center, left hand or right hand sides. Other options include removable multi-position shower seats and wheelchair barrier free access. In addition, if you are tired of the white or biscuit colored shower stalls, consider buying other color options like tea green, grey or almond. They are mostly constructed of bright and shiny high quality acrylic or fiberglass so any color you choose will brighten a bathroom.